Not so fast — those slaves are mine. William K. Lane v. Jane Bennett et al., 56 NC 371 (1858). This case was removed from the Wayne County Court of Equity. By valid will, Furnifold Jernigan made several provisions for the disposal of his slaves. To his wife Jane Jernigan (who later married Thomas Bennett), he left 13 slaves, including Bill Winn, John Winn, Simpson and Anne. To his daughter Mary Anne Kelly, he left eight slaves, including Olive. He provided for the liberation of “negroes, Dave, Tom, Morris, Lila and Mary” and their transport to a free state, and he directed that ten named slaves be sold. John A. Green and William K. Lane were named executors. Before the legacies were paid out, Adam Winn filed suit to recover John Winn, Bill Winn, Simpson, Anne, Olive and Dave, claiming that (1) he had mortgaged the slaves to Jernigan to secure payment of money Jernigan loaned him, and (2) he had a judgment attesting that he had repaid the money, and the slaves had been reconveyed to him. The Winns of Mount Olive. On March 20, 1838 the county records show that in consideration of the sum of $19.00, Adam Winn deeded the railroad a right-of-way through his lands. In November, 1837 and again in February of 1838 the President and Directors of the railroad had appealed to the Wayne County Court of Pleas and Quarter Sessions to force Winn to sell them a right-of-way. At that point the railroad was getting near the county line. Winn sold in 1838. It is believed that Winn’s land lies along present day Center Street. The 1838 deed to the railroad stated that the adjoining lands to the north belonged to Basil Kornegay, a rich Duplin County planter, member of the state House of Commons in 1814, and brother-in-law of William Rufus King, Vice-President under Franklin Pearce. The adjoining land of Winn’s was owned by Charles Winn, who was a member of his family. With Winn’s lands on the south, and Flowers’ and Slocumb’s on the north, the railroad had a clear right-of-way to Dudley. The railroad track begins at Wilmington, curves at Faison, and then runs in an almost direct line to Weldon. When it was finished in 1840, with 161 miles of track, it was the longest railroad in the world. The Winn family is one of the most interesting in the area. In 1836 Ginny Winn purchased a hundred acres of land from Ezekiel Norris in the lower part of Wayne. This is the first land transaction by Winns in Wayne County, though John Kornegay of Duplin County deeded Adam Winn, also of Duplin, land on the northeast “precosin” (swamp) on September 18, 1834. This land ran into Wayne County at one point near present-day Mount Olive. In the 1850 census the Winn family is listed as “mulatto”, but in the 1860 census they were listed as “black”. 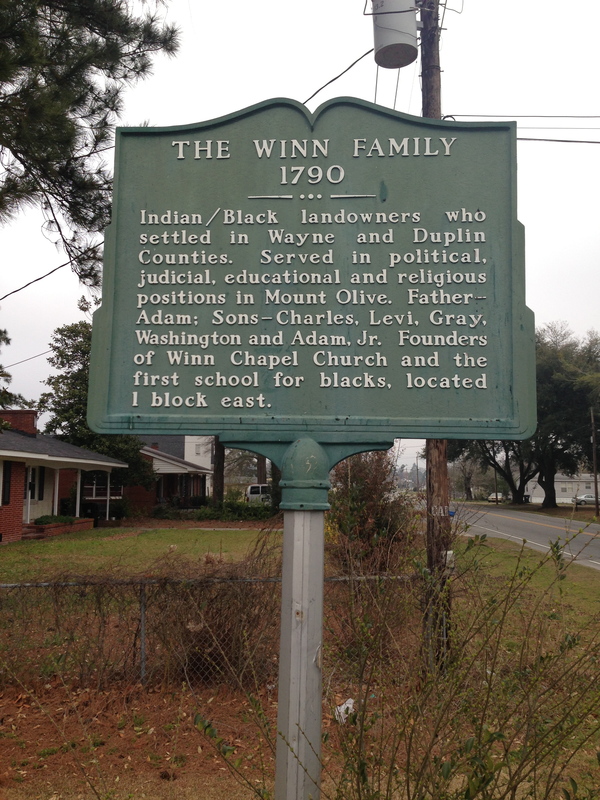 The Winn family were free blacks from Duplin County who had received their freedom prior to 1834. The Artis, Simmons and Greenfield families of Mount Olive were also free blacks, according to the1860 census. Adam Winn was himself a slave owner, for in April 1849 he borrowed money from Benjamin Oliver of Duplin, and put up three slaves, Bethana, Martha and Oliver, as security, along with 133 acres of land. The Winns did business with the most prominent and respected white families, and through the years have generally been considered the most outstanding family of their race in the area. They have produced farmers, school teachers and tradesmen and have been leaders in the black community of Mount Olive. Adam Winn who was also one of the first magistrates of Mount Olive, had sons, William, Charles and Levi. Charles and Levi were blacksmiths, the first to be located in the village of Mount Olive. Levi Winn owned land west of the railroad which was later purchased by Dr. Roberts, and transferred in 1854 to William W. Loftin and Dr. Benjamin Franklin Cobb. William and Charles Winn also owned land in the Mount Olive area. Of sound mind and memory. Item 1st – I leave to my beloved wife America Winn the plantation where on I now live during hir natural life time, and after her death I give and bequeath the said plantation to the lawfull heirs of her body. Item 2st – I give and bequeath to William Winn, Churchwell Winn, Margaret Capps, Levi Winn, Mary Winn, Francies Winn, Charles Winn, Wyett Winn and Nancy Winn, my tracks of land lying on Brooks Swamp and adjoining the lands of A.T. Grady and the heirs of James Kelly Dec’d to be devied between them. Item 3 – I leave to my wife all of my Househole and Kitchen furntiture during hir naturall life and after hir death to be devied between hir children. Item 4th – I leave all of the balance of my personall property to be sold by my Executor for cash and pay all of lawfull debts and the Balance if any to be devied between the children of my wife America Winn. Office of Clerk of Superior Court, Wayne County Courthouse, Goldsboro NC. In the 1860 census of Brogden, Wayne County: Charles Winn, wife America, and children Churchill, Marina, Levyet, Mary, Frances, Wyatt, and Nancy. Lost or Mislaid, sundry Notes and Bonds. 1 Bond that I hold against Adam Winn for one boy, Woodward Winn. 1 Note against J.A. Brady for $200. 2 Notes against W.L. Jenkins, one $20 and one $10. My Accounts and Receipts payable to me. 1 Note against W.B. Field; Land Deeds, and my free papers. I forewarn all persons from trading for said notes and accounts as I have not got value received for them. HENRY SIMMONS. Nov. 12. Fayetteville Observer, 19 November 1860.